Every good toolkit needs a good quality socket set. But how do you know which socket set will suit your needs or be the best value for your money? Sadly there are hundreds of ratchet and socket sets on the market that are made from low quality steel and are not fit for purpose. To the uninitiated, most socket sets look the same, and the final decision often comes down to price, availability and how solid they feel. However, once you start to look at the features of various socket wrench sets, you begin to notice differences in quality, number of sockets and technical details related to the number of points and teeth. If you are in a hurry, here’s a summary of the winners in each category. Scroll to the end to see why we selected each set and a mini review of the winners. There are few things you need to consider when selecting a socket set. While sockets can measured in inches or millimeters, drive sizes are almost exclusively measured in inches. The inch measurement is called SAE (or imperial). It was exclusively in use until 1965. The most common sizes range from 5/32″ to 1-1/2″. The millimeter measurement is also called Metric. It was introduced around 1965 when Britain started to move to the metric system and is commonly available in sizes from 3mm to 80mm. When you are looking at socket sets, you will need to decide if you want SAE or metric sockets. This will depend on the types of vehicles or projects you are working on. A large number of sets come with both SAE and metric in the same box. A distinguishing feature of the ratchet is the size of the square peg on it that the sockets seats on. This is called the “drive” size of the ratchet. Drives tend to come in one of four different sizes. 1/4″, 3/8″, 1/2″ and 3/4″. As a rule of thumb, larger sockets require a larger ratchet drive. Larger bolts require more torque to turn and using a smaller head may damage or break the ratchet. This is especially true when you are using a breaker bar, an impact wrench or a power tools. Some small socket sizes can't be used with larger drive ratchets – and the same applies with large sockets on small ratchet heads. There is a good overlap of compatible sizes and for this reason, most people will purchase a 3/8″ or 1/2″ set (or both). If you need larger size sockets, you will need to look at a 1″ drive socket. They can normally handle up to 1-1/2″ or 80mm sockets. With a little bit of care, you can use adapters to attach 3/8″ sockets to a 1/2″ drive (or other sizes). What is an impact socket set? An impact socket is designed to handle high torque and impact forces without cracking or shattering. They are designed to work with an impact wrench or a power tool. The good news is that an impact socket set can also be used with traditional hand tools and the extra cost is worth it for the versatility (and robustness) they provide. Most impact sockets sets are made from chrome molydbenum and have black oxide coating. This is because chrome plating tends to crack under impact or high torque conditions. It's important that you don't assume a black oxide socket is safe to use with an impact wrench – as this is also used as a finish on some standard socket sets. What is a master socket set? A master socket set contains a full set of socket sizes and doesn't skip any sockets within the range. 3mm to 30mm (in 1mm increments) and 32mm to 38mm (in 2mm increments). It also includes 3.2mm, 3.5mm, 4.5mm, 5.5mm, 41mm, 42mm, 45mm, 46mm, 48mm, 50mm, 54mm, 55mm, 58mm, 60mm, 63mm, 65mm, 67mm, 70mm, 71mm, 75mm, 77mm and 80mm. Why do some sets have missing metric sizes? Make sure you use the correct metric socket for the sizes that are not listed. if you use an oversized socket, you risk damaging or rounding the head of the fastener. What is a pass through socket set? A pass through socket allows bolts or rods to pass through the center and saves you having to trim the end off long treads or to resort to traditional offset hand wrenches. This type of socket has a hole through the middle, making it into a set of hollow tubes. Because of it's design it can be used on any bolt, without length becoming an issue. You need to be aware that a pass through socket requires a purpose built ratchet that clamps around the socket or has a hole through the drive portion of the tool (normally comes with the set). This means you can't use ratchets from other sets without attaching an adapter first. A deep socket is a longer version of a standard socket. They are extremely useful when you need to get over the end of a long bolt to undo a nut without resorting to a pass through socket set. Unlike a pass through set, the hole or cavity inside a deep socket stops when it reaches the drive head. For this reason, there is still a maximum length thread that they can fit over. If the thread is too long, you may still need to revert to a pass through set – or you may decide to cut the length of the thread down to make it shorter, to enable you to use a deep socket. If you don't have a pass through set (and space allows it), you could also revert to using traditional offset hand wrenches or spanners. A good ratchet has at least 72 teeth. The number of teeth affects how far you need to swing the ratchet between swings. Having more teeth allows you to work in tight spaces and choked up engine bays. A ratchet with 72 teeth needs 5 degrees of movement for it to click and to give you the ability to turn your fastener. In comparison, a 120 tooth ratchet only requires 3 degrees of movement and a 150 tooth ratchet only requires 2.4 degrees of movement. The saying that “more is better” doesn't apply when we are talking about the number of points on a socket. In the case of sockets, six points is significantly better than 12. The points are the corners inside the socket head. Most sockets have either 6 points or 12 points. When you twist or apply torque to a socket, nearly all the pressure is applied at the corners of the nut or bolt. A 12 point socket relies on the corner to apply most of the turning force. However, a six point socket can also apply force through the flat interior edges – giving a snugger fit and a more evenly distributed force pattern. They have thicker walls and apply force to the flat shoulder of the hex bolt/nut instead of the corners. A 12-point socket is fine for most lightweight repairs, but heavy wrenching calls for a six-point socket. A six-point socket is much less likely to slip off a stubborn fastener or round over the corners. Socket wrenches can be made out of a wide range of materials and finishes. It's important that you select a finish that has strength and hardness to ensure your sockets don't break under torque or impact. Many cheap sets are made of materials that wont last the distance and sheer easily when they are placed under high (and not so high) twisting or torque. Most sockets are made from a metal alloy. An alloy is made by combining one or more metals to improve the strength or durability. Chrome vanadium is a steel that was developed by Henry Ford in 1908. It has excellent resistance to wear and fatigue and is made up of around 0.8% chromium and 0.1 or 0.2% vanadium. Sockets made from chrome vanadium are normally not used with impact wrenches. Chrome Molydbenum is also known as chrome alloy or chomoly. It is a steel that contains chromium and molydbenum as is more expensive to produce than Chrome Vanadium. However, Chrome molybdenum sockets have excellent torque and shatter proof properties that allow them to be used with impact wrenches and power tools. When it comes to finishes, sockets tend to be coated with black oxide or a metallic chrome plating. As chrome plating tends to chip off under impact use, black oxide is almost always used for impact sockets . However, at least one of our recommended “non-impact” sets also uses black oxide – so you cant assume that black oxide sockets are safe for use with an impact wrench or a power tool. Lets have a look at each of the winners in more detail. After reviewing hundreds of socket sets, over several categories, we explain why we selected each of our winners and the main features and benefits of the choices we made. This set not only looks good, but it is also durable and strong. The Stanley 92-839 socket set is made from black chrome. The sizes and marking are laser etched onto the bodies of the ratchets and sockets. From the list shown above, you’ll notice that the socket set also includes a set of combination wretches and several specialty bits. The ratchet arm operates on a low 7 degree arc swing and the Stanley proprietary Max-Drive design allows for an extra 15% torque, making it easy to tighten fasteners and simplifies the turning of rounded corners. The carry case is made of very durable Blow Molded plastic. The lid can be removed to allow the back case to be used as a drawer tray, and can be easily reassembled for storage for travel. Our only gripe is that sometimes the sockets fall out when you open the case. When we reviewed this set, we wondered about the practicalities of having a black socket set. They tend to be much easier to loose in engine compartments, dark space or poorly lit environments. With that in mind, the black sockets are unique enough that your tools will be easy to identify on a job site. An excellent set that will last a long time. It includes all the standard sizes you need and the etched markings make it easy to identify the correct sizes when you need them. An excellent all-round set for the home mechanic. If you are looking for a high quality budget socket set, you cant look past the Stanley STMT71652 option. The sockets are manufactured from high-alloy steel and have been heat-treated for performance and durability. They have a chrome polished finish to give excellent anti–corrosion protection. The ratchets are 72 tooth (which allows you to use them in tight spaces). With 72 teeth you only need a 5 degree handle swing to catch the next tooth. Lower quality ratchets typically have only 36 teeth, which requires a 10 degree swing. The Stanley proprietary Max-Drive design allows for an extra 15% torque, making it easy to tighten fasteners and simplifies the turning of rounded corners. Even though the sockets are manufactured in China, the tools feel solid to use and come with lifetime Stanley warranty – which means that if any of the tools or sockets break the company will replace them instantly without any additional cost. The 1/4″ drive socket sizes are 5/32″ to 9/16″ and 4mm to 14mm. The 3/8″ drive socket sizes are 1/4″ to 7/8″ and 6mm to 14mm. Both the 1/4″ and 3/8″ drive deep socket sizes are 5/32″ to 1/2″ and 4mm to 13mm. A good budget set of sockets. The quality is good and the lifetime warranty takes away all the risk. The set has a good range of socket sizes; without including useless “filler” socket sizes that you never use to boost the number of sockets in the box. One of the most complete 1/2 inch driver sets available. The sockets are made from premium-quality chrome vanadium steel with a mirror chrome plated finish. This 1/2 inch collection includes EVERY SAE socket from 3/8″ to 1-5/16″. It also includes ALL the metric sizes from 10mm to 32 mm (including 5.5mm). You will be pleased to know that this set doesn’t skip any sizes, and includes the full set of socket sizes for both shallow and deep sockets. A unique feature of this set is the universal joint and the 10 inch extension bar that are not often included in other sets. The set is completed with a 3 inch drive extension and a 18 inch breaker bar. The ratchet has 72 teeth and only requires 5 degrees of working arc – making it an ideal set to work in smaller spaces. If you ever have any trouble with this socket set or any other TEKTON tool, just email us at support@tekton.com or call 888.648.3371. Generally, all we need is a picture of the damaged tool for verification for us to get a replacement sent out to you. With metal pins in the hinges and a solid build, the case is designed to last, and the solid latches ensure the case wont open by accident. There is no doubt the case will be able to withstand a substantial load on top of it in a tool box, or the constant punishment of traveling around in a road service vehicle. The perfect set for a mechanic. With every size covered WITHOUT GAPS (including 5.5mm), a breaker bar, universal joint and 10 inch extension, this set will serve you well for many years to come. In most cases an offset ratchet wrench or a ratcheting combination wrench can do the job. However, for really tricky jobs or tight spaces, a pass through socket set allows you to bypass long threads and valve stems to tighten bolts. They can also eliminate the need for extra long or deep sockets. It would have been nice if this set had come with a slightly longer extension bar (around 6 inches). The two short bars included in the kit do the job – but a slightly longer bar would allow you to work on deeper jobs without needing to resort to offset wrenches. The Bostitch sockets are made from chrome vanadium steel and the sizes have been laser etched on. They come with a lifetime warranty from Bostitch, with no proof of purchase required. Do you really need a pass through set? A pass through set certainly makes it easy to work in tight spaces and when you have long threads or rods to work around. The Bostitch BTMT72287 is an excellent set that covers the full range of SAE and metric sizes. The lifetime, no proof of purchase warranty, ensures your set will serve you well for years to come. When you get tired of using a manual wrench, or you need extra torque, you will need to consider using an impact socket set. The Sunex 2568 socket set is manufactured from high quality chrome molybdenum and comes in a heavy duty storage case. 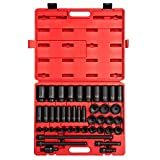 This set consistently receives outstanding reviews on Amazon and can take care of all your SAE impact socket requirements (Metric option also available). The sockets have a very solid build and you can use these sockets with an impact wrench or a breaker bar without voiding the warranty. If there is problem, Sunex stands behind their product with a lifetime guarantee. Its worth noting that the set we reviewed does not come with any metric sizes. Sunex also produce a metric set that can be ordered using the link shown above. If you are looking for a low cost combination set, you could also consider the GearWrench 84916N set (reviewed below), which comes with SAE and metric sizes in the same box. Awesome set of sockets and super tough! You can't beat the price and quality. They work as well as snap on sockets, for a fraction of the price. You can buy them with or without the extension bars and in metric or SAE sizes. Unlike the Sunex 2568 (reviewed above), the GearWrench 84916N comes with both SAE and metric sockets within a single set. At the time of writing, this set was also the #1 best seller on Amazon for the Impact Wrenches category. We like the fact that this case also includes a universal joint and that the 8 to 11mm sizes have a parallel down design to improve access on restricted fasteners. The case is very robust with steel hinges and steel buckles for extra strength and security. The sockets are made from Chrome Molybdenum Alloy and coated with black oxide for corrosive protection. The sockets have laser etching and have also been given a secondary hard stamping. Excellent starter kit for the money and has most of the common sizes you'll need to get your project rolling. Quality tools for a budget price. A good socket set is an essential part of any toolbox. Depending on your intended use, the choices can be extensive. In our opinion, a good impact set can be used by power tools and manual wrenches and ratchets – giving you the best of both worlds. 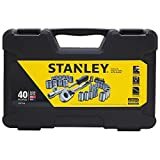 If you are looking for a good all round set, without breaking the bank, you can't look past the Stanley 92-839 and the GearWrench 84916N. If you want to step up a level, the TEKTON 13203 is perfect for a home or professional mechanic with the most important SAE and metric sizes (but not suitable for impact wrenches). And if money is not an issue, we highly recommend the Sunex 2568 – which has a complete “master” set of SAE impact sockets. This would be paired with the Sunex 2569 to complete the “master” set of metric sizes. You would also need to purchase a good 1/2″ ratchet with at least 72 teeth so you can use the sockets in manual mode without the need for an impact wrench. This gives you the best of both worlds and gives you flexibility to use the same set with your power tools or impact wrenches.